So, it’s been such an embarrassingly long time since I’ve updated that I’m actually just going to throw out a list of what we’re currently running from New Phyrexia and Magic 2012, rather than a list of changes. The big philosophical change since I’ve updated is that we aren’t supporting green aggro anymore, which I’ve been very happy with. The ramp cards we have instead are a bigger draw to draft green, in my opinion, and our green decks have been better and more frequent. From NPH, Blade Splicer and Birthing Pod are on a trial basis, but everything else is pretty solid. From M12, the Mages are still kind of questionable, and I haven’t yet been really impressed with Chandra. Everything else is safe. I’m really excited about the Demonic Tutor in particular – so pretty! We got to cube a bit at the GP as well, first with Alex Bertoncini’s combo cube (“no spot removal and no counters- whatever you do is going to happen”) and then with Tim Pskowski’s cube. Finally, on the subject of Innistrad, Diregraf Ghoul is an easy include if you support aggro in black, and I think Spectral Rider (WW, 2/2 Intimidate) will make it as well. I don’t feel strongly either way, but I think Revoke Existence does something cooler, and I don’t run any ways to fetch enchantments. As I’ve talked about in like three other places now, I’ve tried Consuming Vapors before, but I’m trying it again. I used to like Ashes to Ashes- it’s flexible and does a thing. But in another way it’s extremely inflexible, since it does nothing once you can’t cast it and requires two targets. I’m not sad about this at all, and as I’ve said elsewhere- pretty sure my poor opinion of Consuming Vapors was due to evaluating it in the wrong deck/board position. The new Blade of the Sixth Pride is also going to make it in, probably for Serra Avenger or Guardian of the Guildpact (Guardian if I have my way, still holding out for that full art Serra Avenger. Only a little bit joking). 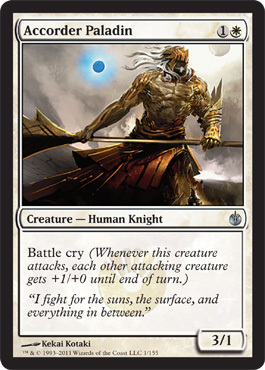 Not that anyone is unaware, but it is just nuts how good the spoiled white cards from Mirrodin Besieged have been. I guess when Phyrexians show up, you step up your game. Poor Brigid. I genuinely love the card and I like unique effects. Nonetheless, something has to make room, and there’s no question of finding a spot for the Crusader. I think Justin will miss Pristine more than I will. She is a solid creature, but cuts are tough and the white-six spot is tougher. And Mana Tithe won my heart. A cut that feels weird, but man has it been a while since Akroma was played. The Hero showed up once already, and totally rocked faces. Not that there was any question. As I said in my Guild article on SCG, I felt that we had a surplus of Wrath effects. Martial Coup is the weakest, so it’s the one. Parallax Wave is a card I’ve been wanting to try forever, and this seemed like the time. Probably should have done this sooner. Planeswalker removal seems about right, and the Cutthroat was more-or-less placeholder anyway. I wanted to try adding more discard, which is what this swap and the next one is about. I guess the Scudder is where you start to think about the difference between “efficient” and “aggressive”. After the Guild decks, I felt that red needed more straight-up burn, and Spikeshot has been ok but not outstanding. Adding burn and things that work with burn. We had Wheel of Fortune in a while ago, but red was so bad at the time that I’m not sure it got a fair chance. As I thought, we overshot a bit on the artifact destruction. Also from the guild thing- I felt green had a surplus of land fetch that doesn’t ramp. Fine, every one of these changes is from the guild experiment. I wanted more Wrath-proof guys in green, and I don’t want a whole color-aligned land cycle, so this seems fine here. I enjoyed Mindslaver, but it doesn’t break my heart to see it go. One of those cards I’ve been wanting to try. Do wish I hadn’t sold my FTV one, though.